A couple of months ago I came across a film that can only be described as a public service announcement. The spirit of common sense that keeps us wearing our seatbelts andfrom getting behind the wheel while under the influence will be the same that makes your resolution for 2013 an easy one, or so I hope. The argument is so compelling that it leaves you with little choice. The Institute for Responsible Technology’s founder, Jeffery Smith expertly distills an overwhelming body of research against the use of Genetically Modified foods into a relevant, accessible and impassioned plea to those that would do right by themselves and their children. The documentary, “Genetic Roulette”, systematically exposes the astonishing truth behind the consumption of genetically modified foods. From the manipulation of the legislative process that deems these products ‘safe’, to the repeated and ostensibly successful attempts to paralyze the research engine that overwhelmingly concludes that genetically modified foods pose a significant health risk, to farmers observing dramatic changes to the health of their livestock after stopping GM feed for just three days, to the dismantling of the GMO myths claiming that genetically modified food are the only way to meet the ‘world food shortage’ and the more than 40 health risks associated with GM foods, Jeffrey Smith provides a clear and comprehensive body of work that leaves little doubt in the viewer’s mind that the only way to reclaim control of your body is to be selective about what you put in it. I have to admit that before seeing this film, my decision to avoid GM foods was largely emotional. I remember an interview with David Suzuki many years ago. He was asked whether or not GM foods were safe to eat. His response was something along the lines of “We have no idea how these organisms will behave in nature because they’ve never existed before now”. Made sense; it was good enough for me. As a physician, I was more concerned with avoiding commercial foods because of the health risks associated with the chemicals used in industrialized agriculture and how they affected overall toxicity. But after seeing this film, not only am I more vigilant about what I bring into my home for my family, I have now begun to refine my prescriptions to my patients, particularly those who are just experiencing naturopathic medicine for the first time ; “Don’t worry about the wheat, dairy and sugar just yet, we’ll have time for that later. Eliminate processed foods from your diet”. In clinical practice the GM issue is particularly relevant to our pediatric patients in that we see time and time again health concerns stemming from ‘Leaky Gut Syndrome’: allergies, eczema, allergies, autoimmune and neurological disorders and immune dysfunction all have their roots in a compromised digestive tract. When we see so many systems affected in a single individual, it seems obvious that one must consider the ‘source’. In Chinese medicine, one of the sources of our life force or Qi comes from the food we eat. Likewise, when the parents, veterinarians, and farmers that were interviewed in this film, stopped to consider why their children and animals were so ill they too had no choice but to question the food they were eating. When people found out about how Bt toxin contributes to gut permeability or how RoundUp ready crops contribute to malnutrition and therefore make us more vulnerable to virulent diseases, there was never really any choice for them except not to look back. Of all the allergists, immunologists, pediatricians, registered dieticians, hematologists, oncologists,naturopaths and internal medicine specialists who commented on the rise of the conditions listed above, every one stated that when GM foods were eliminated from their patient’s diets their health improved. When you experience this film, there may be the tendency to despair. Indeed the problem of GM foods is global leaving no one, not even our infants, untouched. However, as Jeffery Smith describes, it is possible to reverse the damage done. You have a choice about where you spend your money. You have a choice about what you eat. Avoiding GM foods is far from impossible. 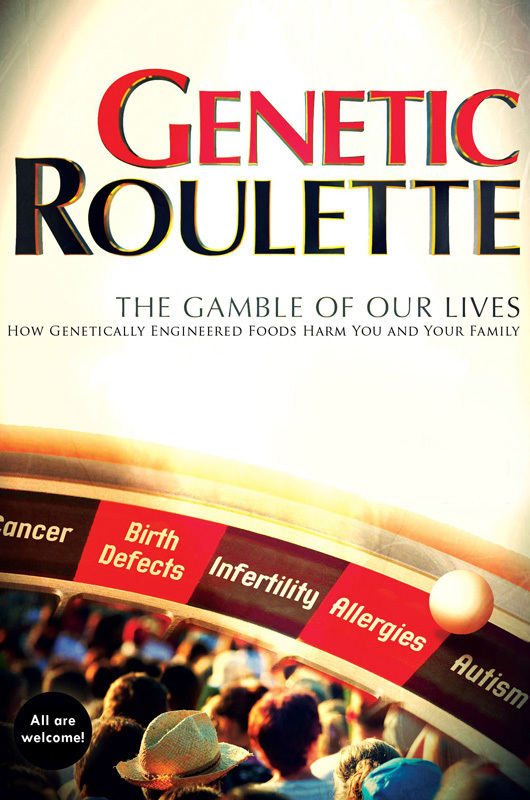 The ‘Genetic Roulette’ website has a vast number of resources that you can access to ensure that you avoid GM foods. An epiphany takes only a moment of clarity, a resolution, only the sincere intention of doing better. If you haven’t already, know that when you make your resolution this year that you will not only be benefitting yourself but your family and generations to come. Mom’s To Be: Don’t Forget Your Probiotics!! Progesterone: Too Much of a Good Thing? Juvenile Rheumatoid Arthritis: Naturopathic Medicine in Action Progesterone: Too Much of a Good Thing?